Here's a photo from Charlie Hulme's archive. Charlie has been running a website all about the North Wales Coast Railway and its connections for many years now and one of these connections is the Sandbach-Middlewich-Northwich branch line, which is used by diverted trains travelling from Crewe to Holyhead whenever the Crewe-Chester line is closed for engineering work. Charlie's photo is just one of a set he featured on his site after a trip along the Middlewich line eight years ago. So much has changed since then. Albion Chemicals, as shown in this picture, has largely disappeared after being taken over by Brenntag (although the company does still have a presence on part of the site) and all the railway paraphernalia has disappeared along with it. 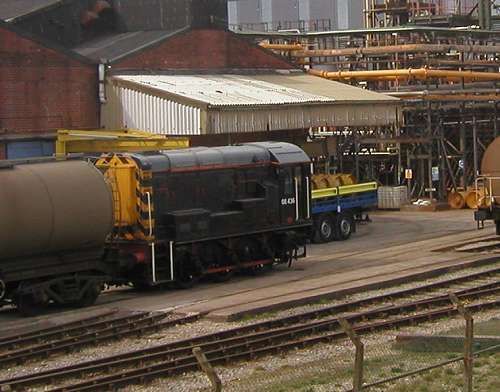 The former rail connection into the works is now just a short stub of line leading nowhere, and the chlorine tank wagons have all gone back to whichever rail company owns them. There's good news, though, about that little diesel shunter, no. 08436. It's now preserved at the Swanage Railway in Dorset and has gone up in the world, getting the chance to shunt passenger coaches instead of chlorine tankers.. The signalling system has also been altered since Charlie's trip up the branch, and trains passing through Middlewich are now controlled from Manchester South. and here's one to the Home Page of his North Wales Coast Railway site. Click on the 'Notice Board' section for up to date news on the the line.